luxamundi: Clay masks: expensive or cheap and cheerful? Clay masks. Great things to have. So simple but so effective. I put one on at least once a week, and always feel so much calmer mentally doing so. I have to take off my glasses when I have one on, so for me, it's a bit like having an enforced ten minute break or so away from technology or anything, and just using that time to relax and enjoy the indulgence of a mask, as well as a little chill out time. Then there's also the skin benefits: detoxifying, purifying, brightening and calming, the list could go on, especially as different companies put different things in for effect. The thing is, clay masks are mostly just clay. Yes, I don't doubt someone will swear by one and someone else the other, but in all honesty, the highest end clay mask isn't really all that different from the cheapest one out there. Or even one that you could try make yourself (I haven't yet, but I'm very much thinking about doing so). And that's the point of this post. As you can see from this post's picture, I've tried the high end (an eye-watering £57 for the Omorovicza Deep Cleansing Mask), to the £10 offering from Body Shop, which also doubles as a scrub of sorts. 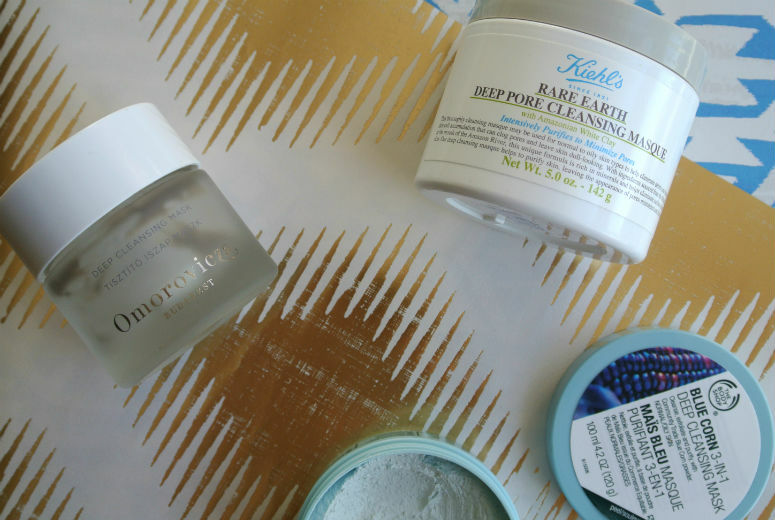 Yes the Omorovicza did come in a lovely glass pot, compared to the plastic containers from the Body Shop, and even Kiehls. Yes it did look slightly more interesting than the standard pale green Kiehls clay mask. But, I don't feel that the overall results from the overly expensive mask were really that far different from cheap clay masks. I may well give into the samples and buy the Aesop Parsley Seed Cleansing Masque some day, and finally get round to trying the Origins one, neither of which are budget, but if there's anything I've learnt from comparing clay masks, it's this: save your pounds, you can use it to buy some new lippie instead.